Me: Hey Peter. How are you? Peter: Not so good. Having some trouble with a critical server. Me: Yeah, I knew that you would call me when there is an issue with critical server. <laugh> Go ahead and explain me the issue. Me: Wow. Never heard of “restore plan” error. hang on a second.. let me open my laptop. Me: Okay. What was the error again? unable.. restore plan..? 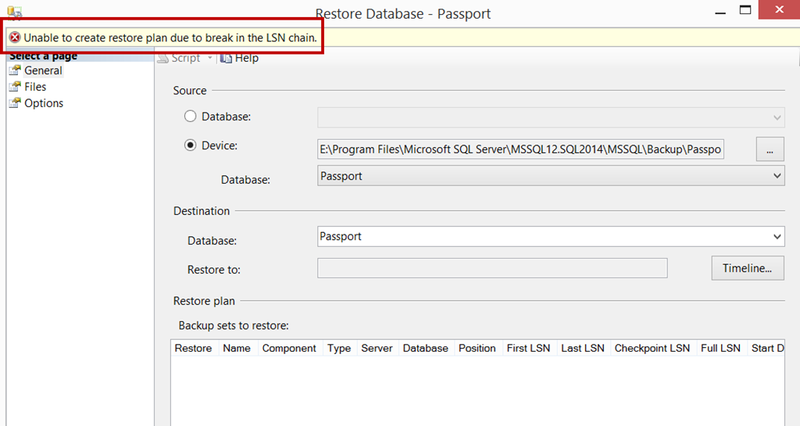 Peter: Unable to create a restore plan due to break in the LSN chain. Me: Well, interestingly, I don’t see that error in sys.messages table in SQL Server Instance. Peter: but it coming in SQL Server. Me: Where exactly you are seeing this error? Tell me exact steps. Peter: I am seeing that error in Management Studio. I am using SQL Server 2012 Instance and SQL Server 2012 management studio to restore backups. I have restored one full backup and now want to restore next log backup. Me: And there is no real break in the chain? Peter: Yes. I have taken them manually, one after another. Me: Okay. Would you mind sending me screenshot and complete error via email. I am on my laptop right now. Let’s fix it right away. Peter: Sure. <1 min silence> Sent. Me. Okay. Let me received it and meantime I am searching. <30 second silence> Okay. Got the email. Me: Okay. that’s SMO error and that’s why I don’t see it in sys.messages. It is failing while creating restore plan to show in UI. Peter: Aha. So, what should I do. Me: T-SQL would work for sure. can you use “Restore log from disk = ‘Path’ command? Peter: Ahem.. any other way.. You know how much T-SQL. Me: Let me see. 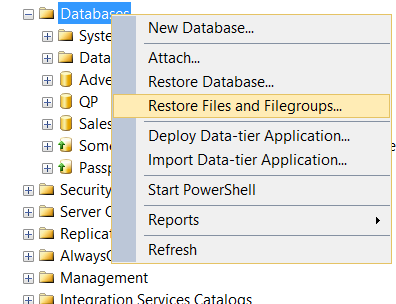 <1 min silence> I believe you have used “restore database” UI? Correct? Me: Yeah, fixed in SQL 2014 Management studio already. Peter: So what should I do? Me: You have many options now. 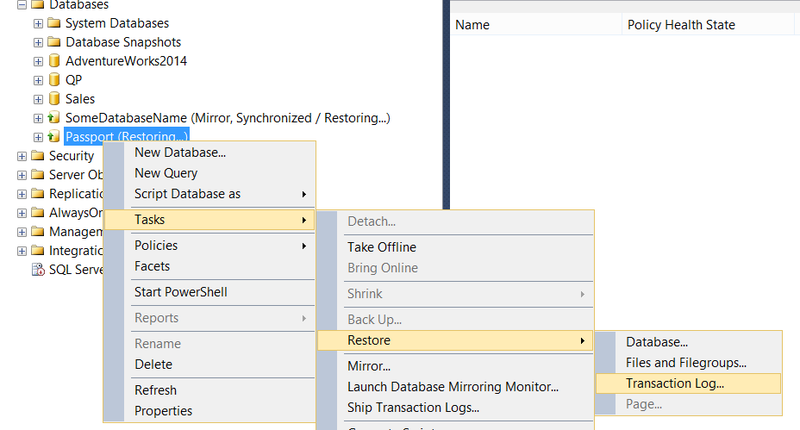 4) Drop the database and restore both backups together (full and log) in same UI. Haven’t you heard of recovery advisor? I will send you link later. 5) and last option, which you won’t like is T-SQL. Peter: Wow. So many solutions to one simple problem. You are a Gem! Me: You are so kind. Thanks. Peter: Okay. Let me do restore now. My manager is pinging me to fix this ASAP. Me: Sure. Talk to you later. Bye. Like the story? Make a comment. Solution: The file "MDF" is compressed but does not reside in a read-only database or filegroup. The file must be decompressed. The file "E:\BlogContent\DatabaseFiles\MyDatabase.mdf" is compressed but does not reside in a read-only database or filegroup. The file must be decompressed. Error giving hint about some kind of compression. So if we look at the folder which is specified E:\BlogContent\DatabaseFiles it was in blue color. 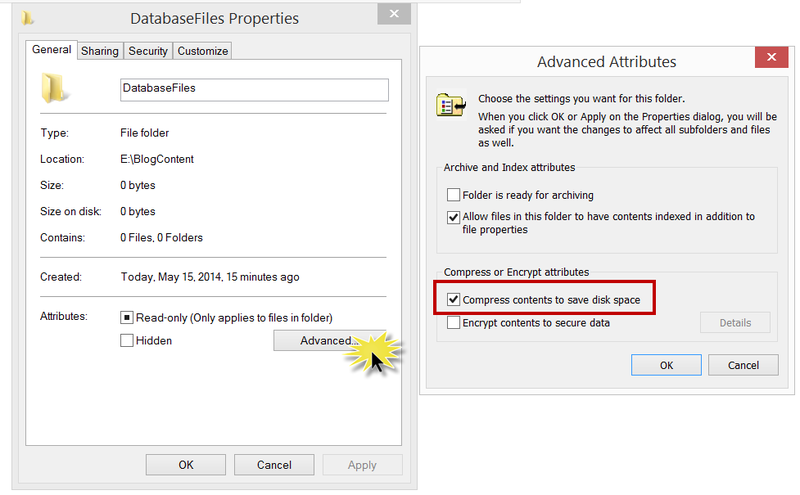 The checkbox “Compress contents to save disk space” is checked which means compression is enabled. Once we uncheck the box, we should be able to create database. System.Data.SqlClient.SqlError: The file "E:\BlogContent\DatabaseFiles\MyDatabase.mdf" is compressed but does not reside in a read-only database or filegroup.